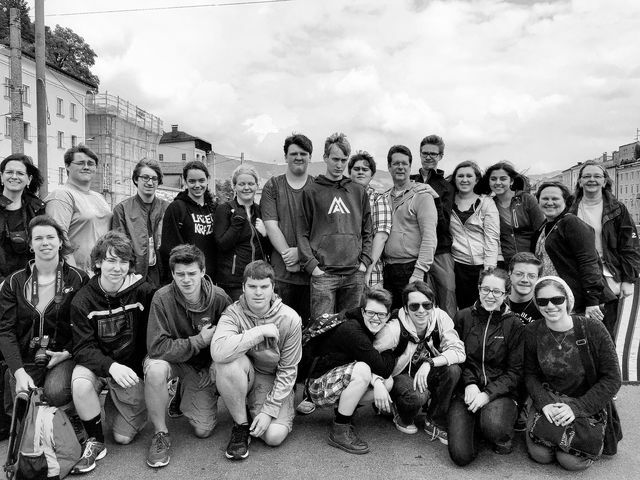 Big Walnut High School German language teacher Frau Georgia Craig and students on their summer tour of Germany had a bit more of an adventure than they planned on. Frau Craig said the trip got off to a challenging start June 15 when storms in Chicago forced their flight to be cancelled after a long day of waiting at the airport in Columbus. Frau Craig said they were worried that the two-day delay would not work with the group’s planned itinerary, and whether or not it was going to be possible to get those two days back. The student’s trip began in Munich where they toured the Frauen Kirche (Church of our Lady), Marien Platz (St. Mary’s Square), and climbed the 308 steps to the top of the Alter Peter, Old Pete or Saint Peter’s, the oldest church in Munich. They toured the BMW showcase room where they saw new BMW models coming out, and observed surfers on River Isar. “We were also able to dress like traditional salt miners as we traveled to Salzburg, Salt Mountain,” Frau Craig said. “We rode a miner’s train into the mountain and learned about the importance and wealth of salt during medieval times. We went from one level in the salt mines to the next by sliding down wooden slides that were five and six stories high. They also traveled to Neuschwanstein Castle, the castle after which Walt Disney modeled the Disney Castle. Frau Craig said while the students were at the castle they learned about the strange life of King Ludwig, who built the castle, and about his mysterious death, which still remains an unsolved mystery. After Munich and Salzburg, the students travelled on a high-speed train to Berlin. In Berlin the students toured the Holocaust Memorial and Check Point Charley Museum, and also had the opportunity to tour the Topography of Terror, a memorial located on the site of the Nazi Gestapo headquarters. The Topography of Terror Memorial focuses on the different victims of the Nazis – Jews, Romany Travelers, disabled people, religious people, people of different political beliefs, homosexuals and intellectuals. Frau Craig said to view photos from the trip go to Facebook and search for The Big Walnut German Program.